SHEHJAR - Web Magazine for Kashmir :: Maha Kumbh Mela: I was there! "The tale is great, one may say enormous. Every twelfth year is held to be a year of peculiar grace; a greatly augmented volume of pilgrims results then. The twelfth year has held this distinction since the remotest of times, it is said." The Maha Kumbh Mela in Prayag (Allahabad), the host city in the northern Indian state of Uttar Pradesh, is an experience and like no other. You have to go to the Kumbh yourself to be able to fully learn, decipher and fathom just what it entails. For someone who has never gone to the Kumbh, I do not think any amount of literary research or wistful anticipation can prepare them enough for what the experience entails, and what they will bring away from it eventually, in the form of practical lessons, life-changing experiences, and long-lasting memories. It is no surprise that the Kumbh has gained international fame as "the world's most massive act of faith.” Over ten million pilgrims attended the Kumbh of 1998 and the number grew to an estimated 70 million when pilgrims and “spiritual” tourists from 140 countries attended the Kumbh of 2001 making it the largest gathering of people ever recorded in history. 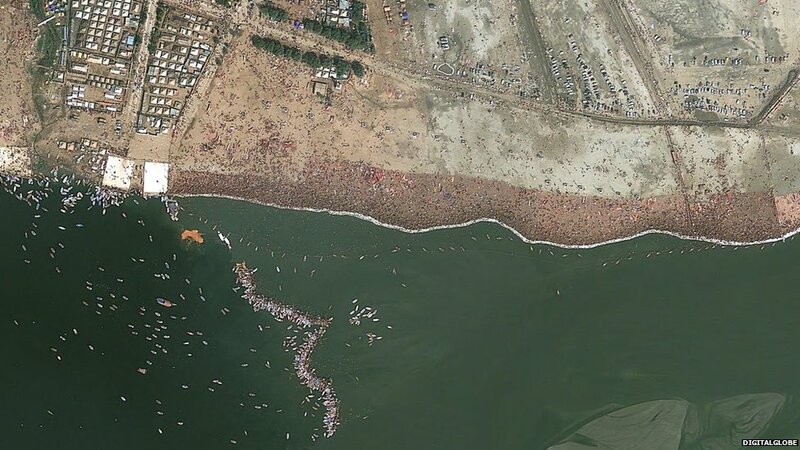 The gathering was so large that it could be seen from space and was captured by NASA satellite images. To put these numbers in perspective, the 2001 population of the entire United Kingdom was estimated at a little more than 62 million, and Travel & Leisure Magazine declared Times Square in New York City the number one most-visited tourist attraction in the world with 39.2 million annual visitors. The number of pilgrims is expected to be even higher during the Maha Kumbh of 2013 as the population and faith have increased significantly in the last decade. Hinduism does not make pilgrimage obligatory, yet ordinary Hindus attribute great importance to the Kumbh. There is no advertisement for this phenomenal gathering; a single line in every traditional Hindu calendar proclaims the date as the beginning of the Kumbh. And people pour in. Not because of some publicity given or because of media coverage or to claim that they have been there. Mostly it is not even mentioned or talked about in the families that visit the Kumbh. It is a personal need for their spiritual sustenance. The main highlight during the Kumbh is the observance of a sacred dip at Triveni Sangam - the confluence of Rivers Ganga, Yamuna and Saraswati. 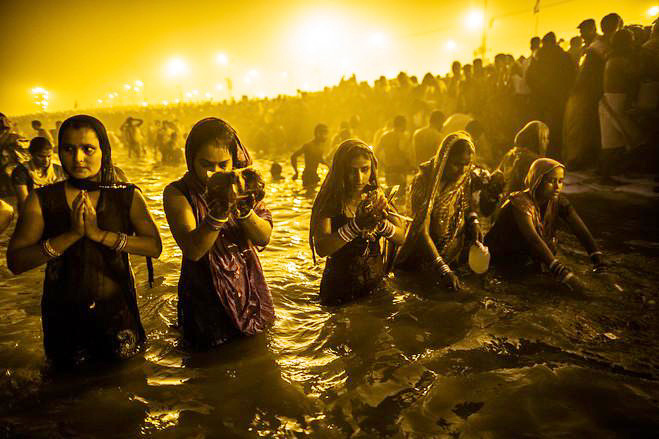 Hindus believe this was where creation began and bathing at the Sangam during the Kumbh is equivalent to millions of pilgrimages as it absolves them of sin ends a cycle of reincarnation and speeds the way to “Moksha” or Nirvana. Prayag is believed to be the place where one drop of the amrit (immortality nectar) fell after the gods and asuras (demons) fought over it during the samudra manthan (churning of the milk ocean). 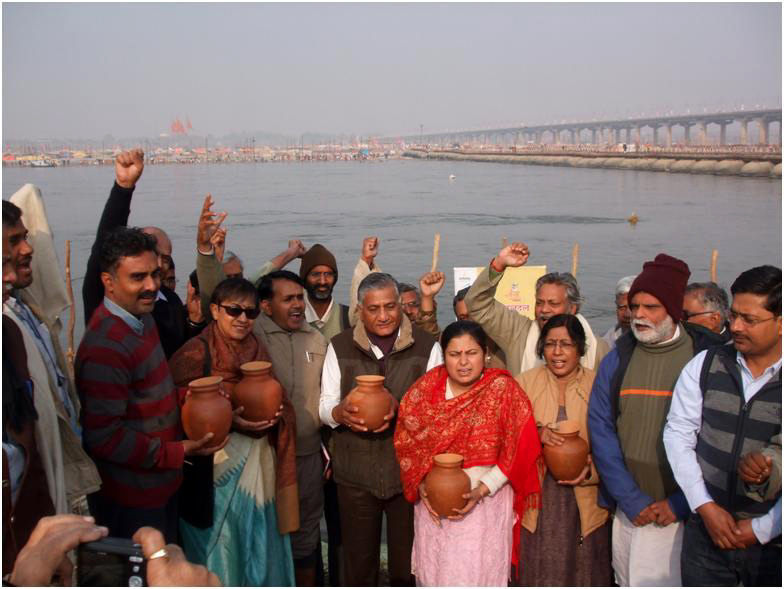 Three more drops fell at Haridwar, Ujjain and Nasik, respectively - the other sites for Kumbh Melas. The combined sanctity of the rivers, coupled with the overwhelming presence of humanity that congregates once-every-12-years has earned Prayag the rank of Tirtha Raja - the king of sacred pilgrimages. As founder of the Green Kumbh Movement, my experience at the Maha Kumbh is both bitter-sweet and inspiring. Kumbh Mela is living proof that incredible faith in God, quite literally, is the force that binds and turns the Hindu world's calendar. For several millennia, countless of Hindus men and women from the four corners of the earth, have made the pilgrimage to the Maha Kumbh which eclipses all other religious pilgrimages on Earth. It draws an incredible spectrum of humanity: yogis from the Himalayas, Sikhs from the Punjab, peasants, businessmen, sannyasis, movie stars, politicians and in recent years, large numbers of Westerners. Being a pilgrim at the Kumbh feels like you are surrounded by a sea of sheer humanity. And, to take the 4:00 AM dip in freezing water and biting cold air at the foggy Sangam is a moving experience. There is a soul grasping feeling of spiritual synergy when countless people come together to engage in the collective bathing ritual of plunging and praying. The whole atmosphere is surcharged with religious zeal as sacred chants, prayers, mantras and kirtan fill the air and it is quite contagious. The river banks are crowded with the common people who pour in a never-ending stream. There are countless women from remote villages, many of who carry their belongings in neatly packed bundles on their heads. Driven by sheer faith, the devout men, women and children, young and old make their way to the waters while reciting sacred prayers. As they immerse in the cold waters, they seem to be oblivious of the people around them. Many come with fresh marigolds, oil, cotton balls, incense sticks as offerings to the sacred river - all in such an aura of harmony and good nature. There are no special facilities or changing rooms. With no apparent inhibitions, the women in their wet sarees clinging to their bodies change in the open, secure in the knowledge that their belongings are safe and there will be no stares or curious gawkers. Far removed from the excesses of the shiny gurus, their ostentatious “pandals” and their rich devotees, these ordinary pilgrims make the Kumbh a truly extraordinary event of faith. The overall atmosphere is surprisingly peaceful given the large crowd. There is a heavy presence of security personnel. Armed with the latest weapons, these officers are polite and patiently act as crowd controllers. There is no aggression or ill temper or pushing and shoving or any of the other sparks that can so easily ignite a crowd. I have never, ever, anywhere in the world seen such huge numbers of people coexisting in such apparent harmony and good nature. And, no – we did not see a single “Naga Sadhu” during our five days stay. And, yes, the Kumbh is not all about Naga Sadhus! The Kumbh seems to have it all. There are hospitals, police stations, gas agencies, a post office, a radio station, and a railway reservation centre. There is a street to the left where nationalized banks have opened offices made of plywood. A street to the right has a canvas courthouse for offences committed at the Mela. The Kumbh has its own administration: A district collector, a senior police superintendent, a chief medical officer, a chief engineer, electricians, restaurateurs, boatmen, and garbage collectors. It has 156 km of steel-plated roads, 18 pontoon bridges, 980 km of electricity wires, 550 km of water pipelines, and a budget of Rs.1,200 crore. It is a fully functional metropolis conjured out of nothing, only to be dismantled 55 days later! Quite an organizational feat! The obvious question that is being asked is if such a feat of organization can be accomplished for this purpose, why not elsewhere? Why can't India's villages and towns be similarly transformed? Then there is another side to the Kumbh. If the central purpose of the Kumbh is religious, then it is surprising to see the Kumbh in an up market commercial avatar. There are large, colorful hoardings put up all over the place with pictures of spiritual leaders advertising their presence. Spirituality is already so publicly displayed in everyday India, but this is a whole new level that renders the Mela part village fair and part massive bazaar. The spiritual leaders claiming to be “sanyasis” seem to be competing for a piece of the pie. What is even more surprising is the colossal amount of money that must have been spent in production and display costs for the hoardings. And what will happen to these hoardings once the Mela has concluded? Is there a system in place for their safe disposal? Not to be outdone by the spiritual leaders, local politicians and businesses too have put up colorful hoardings, some to welcome the pilgrims while others advertising their products. However, it is refreshing to see some that carry educational environmental slogans. A cacophony of sounds of music, and public service announcements are being amplified at high volume from loud speakers attached to tall posts. The “soundtrack” continues all day and night, with only a few hours of pause in the early morning hours. There are non-stop lost-and-found announcements that ask people to collect their family members from a giant red tower at the Sangam where more wandering souls land up with every passing minute. There is a constant flow of husbands who have lost their wives, mothers who have lost their children, and grown men who have lost their aged parents. These people come from all corners of the country, and sometimes even from overseas. If latest media reports are to be believed, an estimated 1.55 lakh (155,000) remain stuck at the Kumbh's "Lost and Found" camp at the end of the Mela. But the Kumbh was marked by something altogether worse - tragedy struck the Kumbh on February 10, the auspicious Mauni Amavasya snan, also called Shahi Snan or royal bath - an important bathing day. A stampede at the Allahabad Junction railway station’s footbridge No 1 killed 37 people and injured more than a 100. Allahabad is not alone in experiencing such grief. Developed and developing cities across Asia and beyond have experienced similar tragedies. At Germany’s annual Love Parade in Duisberg on 24 July 2010, twenty one people died during a stampede. In 2006, 350 people were killed following a crowd panic at the Hajj. Both countries responded in different ways: The Love Parade no longer takes place while Saudi Arabia spent millions on new emergency exits and notably a larger bridge to ease crowd flow. If there is any good to come out of the Kumbh tragedy, it could serve as a catalyst to re-examine and reduce future risks not just in Allahabad but in other fast-growing cities across India. Government and event organizers should be looking to learn from the prompt and hopefully thorough investigation promised by Chief Minister Akhilesh Yadav. The investigation should not only get to the bottom of what caused the stampede but set about ensuing that it never happens again. To do so the probe must look beyond the immediate tragedy and examine some of the broader risks facing India’s rapidly growing mass gatherings. Building safer facilities is something all city mayors, councils and organizers should be actively pursuing, rather than waiting for disaster to be the motivator. Some things are obvious targets for such a change. Decent infrastructure is fundamental to basic safety. In Allahabad various rumors swirled in the immediate aftermath of the disaster. They said the stampede had been caused by a bridge that was overloaded and a last-minute change of platform caused a panic. While these may be speculation, large pilgrimage centers must give proper priority to establishing comprehensive building codes, putting in place health and safety legislation, building a cadre of qualified inspectors and ensuring event management regulations and volunteers with are in place. These are the foundation stones on which public safety is built. It is also clear that the emergency services responding to the Allahabad disaster, although desperate to help once tragedy struck, not only did they not foresee the potential for a disaster, they were not adequately trained to handle large crowds. It is clear that there were not enough first aid staff on hand at the railway station. Eyewitnesses claimed that police responded with baton attacks, further panicking an already nervous crowd and, in desperation, worsened the stampede. Specific training for both police and local authorities on how to manage and control crowds is essential for large scale events such as the Kumbh. This requires careful planning of event sites and route access and specialist training for emergency management personnel using simulated crowds so they are disaster ready and properly equipped. Such training must be incorporated into basic officer and police training institute curricula if it is not done so already. The lessons of this disaster for Allahabad and for other cities in the region are many. Better preparation and planning to cope with the challenges of mass gatherings are essential for any city in the future. In Allahabad’s case, let us hope the Chief Minister’s investigation takes a wide and deep look at how Allahabad can be made a safer city for all so that future Kumbh Melas can take place in the knowledge that this kind of tragedy will never happen again. Finally, incessant rain turned some of the Maha Kumbh Mela site into a swamp while rising waters of the Ganga and Yamuna added to the problems of the festival officials. Better advance planning for inclement weather would be advisable in the future. 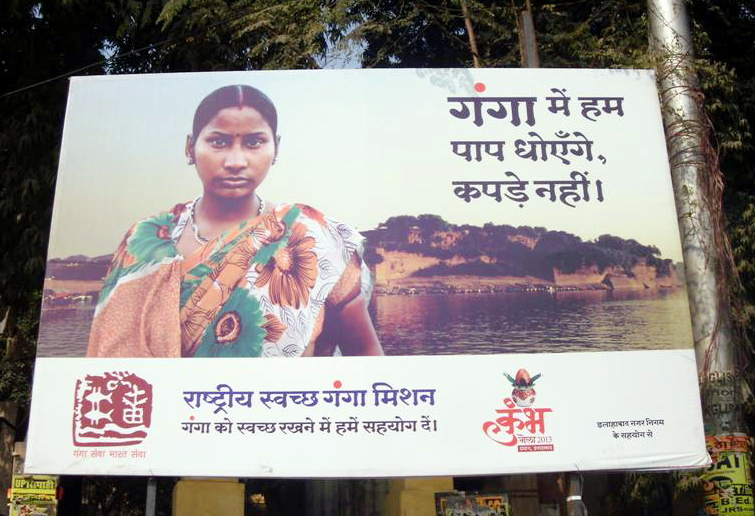 As founder of the Green Kumbh Movement I feel that the people that usurped the “Green Kumbh” concept only to gain personal media coverage should have instead played a lead role in encouraging the massive crowds to clean up the river banks, roads, temples, plant trees and engage in creating awareness about keeping the environment clean. It was painful to see the dilapidated condition of some of the holiest temples and streets of what once was a beautiful and clean place of great pilgrimage. In the 55 days that the Mela lasted, a committed force of volunteers led by equally committed leaders could have cleaned up and also restored a public park or one of the many dilapidated temples in and around Prayag. In my opinion, the spiritual leaders appearing on the hoardings could have played a key role in making the Kumbh truly green. Sadly, while the Kumbh Mela of 2013 was an organizational marvel, a great opportunity to transform the area and enhance the quality of the environment was missed. Kusum Vyas is outspoken, dedicated. Imbued with intense conviction about the various causes she supports, she throws herself heart and soul into creating awareness about them. 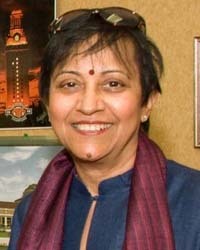 Her interests run the diverse gamut from spearheading the Gulf of Mannar World Heritage Site Campaign that is pivotal to the preservation of the sacred Ram Sethu, to raising funds for a troupe of blind dancers from India, to encouraging people to be more eco-friendly, and to saving the crocodile from extinction.